This is the first of a series of two featuring a fairly tatty copy of the auction catalogue of Handcross Park Estate on 10th July 1873 in the City of London. The Large Version shows a copy of the 2ft x 3ft map. Of the 9 lots, 4 lots are for various pieces of land and forest. The remaining 5 lots include buildings as follows. Despite glowing words of praise for the property and its parkland offered by the auctioneers, it is interesting that the text also tells us that it is an “Old Fashioned Residence”. On page 3 it goes on to say that it is “A magnificent site for the erection of a mansion”. 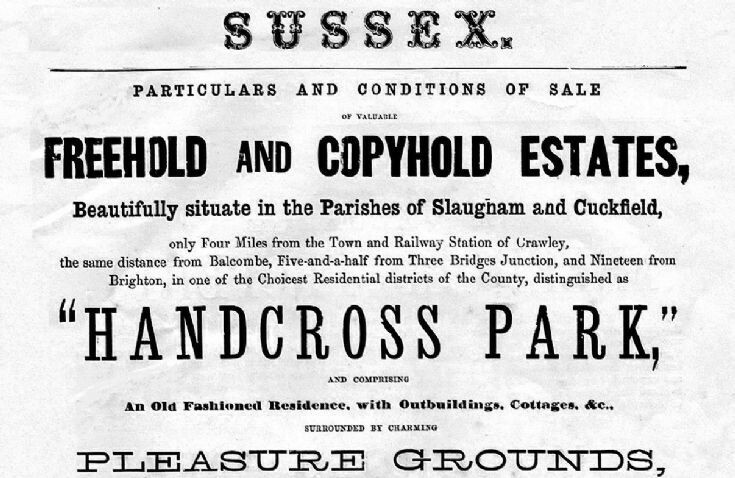 Needless to say Handcross House was demolished soon after the sale and its replacement “Handcross Park” was built some considerable distance from the main road. Lot 2 comprises the pair of semi-detached Oak Cottages, a short distance south of the present-day Coopers Wood. Select Open Document to view the first few pages of the catalogue. The remainder can be found at picture #2427.